The Center’s photogrammetric camera equipment consists of a number of high resolution digital SLR cameras. This includes two Canon 5D Mark II DSLR cameras with fixed 28mm and 50mm lenses. The 5D Mark II is the Center’s highest resolution DSLR with a 36 x 24mm ‘full frame’ sensor and 21.1 million effective pixels. Other DSLR cameras include a modified Nikon 200 (10.2MP) for infrared photography, a standard Nikon D200 (10.2MP), and Nikon D70 (6.1MP). The Epson 10000XL is a large format scanner designed to scan photographic prints or transparent film media up to 12.2″ x 16.5″ at a resolution of 2400 dpi. 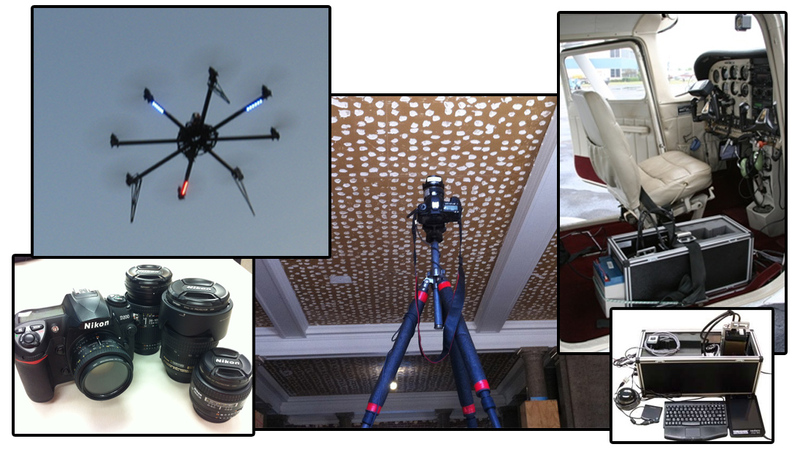 A low-flying, remote controlled octocopter was recently acquired by the Center and is currently being assembled and tested. Other remote sensing capabilities at CAST include the TerraHawk Imaging System, which is a multi-spectral system designed to mount and operate inside an aircraft fitted with an appropriate camera port.